Click here to learn about different techniques for aiming your darts.Or check out the Performance Tips section for additional information on the game of darts. Great deals on dart supplies, click here. 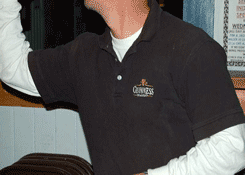 What stance should you use when throwing darts? The dart stance is often overlooked; however a proper stance sets up your whole dart game. No matter what game you are playing make sure it starts off on the right foot by following these simple guidelines. Line up properly. Ignore the center area of the dart throwing line on the floor. Many times the center area on the line can be marked incorrectly. Look at the bull’s-eye and draw an imaginary down to the floor and then continue it out to the throwing line. Find something on the floor to anchor this point, like a scuff mark or a stain. This mark on the floor is where you should should line up every time. 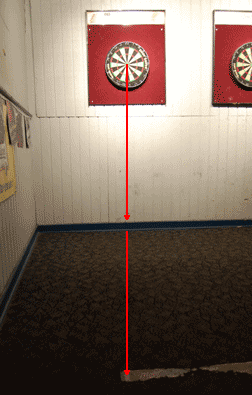 By approaching the board from the exact same spot your dart throws will become more accurate and consistent. It seems very simple, but many people line up incorrectly without realizing it. Standing at the line. You have two basic options - sideways or facing the board. Standing sideways puts your throwing arm and your eyes on the same line reducing the possibility of your arm moving side-to-side and your elbow drifting away from your body. You can even move your back foot behind the front foot to further pull the elbow in and tighten the throw. Your other option is facing the board with your front foot pointing at the bull’s-eye and your back foot behind you and to the side for maximum balance and comfort. Try both and decide which one is most comfortable for you. Firm footing. Accuracy begins with firm footing. 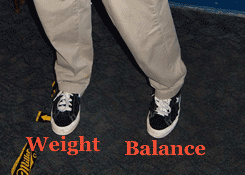 Feet should be shoulder's width apart with a flat front foot that carries more weight than the back foot. The front foot provides a steady base that reduces fatigue, and the back foot maintains balance and helps with accuracy. Leaning too far forward can lead to possible back injuries over time so make sure your stance isn’t too far forward to cause strain or pain after throwing. Shoulder position. Your shoulders should be parallel to the ground – but personal style can vary from 50 to 90 degrees based on throwing comfort. The shoulder stays fixed as does the rest of the body. Try to keep your spine as straight and still as possible while keeping your arm relaxed and in control. Avoid lunging towards the board. Only your arm and hand should follow-through to the board. Click here for tips on a successful dart grip.